One thing becomes clear after spending even a few minutes with Executive Pastry Chef Antonio Bachour: he takes his desserts and his craft unbelievably seriously. Many experienced pastry chefs operate with passion, but Bachour’s level of enthusiasm is on a whole different level. A highly caffeinated level. “Look at all these different kinds of chocolate!” he says, pointing to a selection of high-end chocolate, including a massive bag of 70% Valrhona Guanaja. “The owners here let me use the top ingredients to make my desserts, whatever I want really!”. 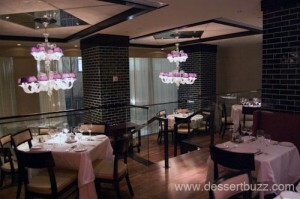 The owners are smart–on many nights nearly half the patrons order a dessert. So either Bachour’s desserts have caught on with the regulars or the hotel is delivering subliminal messages into the guest rooms at night. As he continued leading me on a tour of the kitchens, which included many back staircases, Bachour would suddenly sprint a long length of stairs while talking rapidly about his favorite restaurants to visit while he’s in town (Bachour travels back and fourth from Quattro in Miami and this location). Another unique thing about Bachour — he frequently goes out after his evening service. 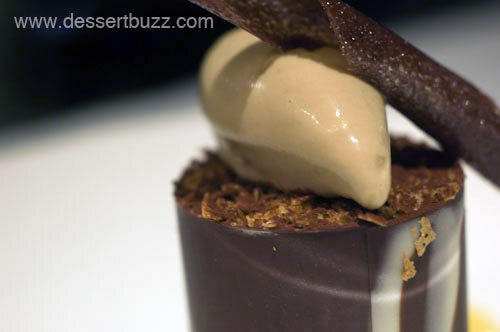 Most pastry chefs are too tired after working 6 days a week plus the evening service to go anywhere to try other desserts. But Bachour claims to sleep only a few hours per night and to prove it he described in detail all the desserts he has tried from at least two-dozen of New York’s best restaurants in only the last few months. He can tell you exactly what he liked about a certain dessert from six months ago. If pastry chefs had to study films about the competition like football and soccer coaches, Bachour would have all the other New York restaurant desserts committed to memory by now. Bachour grew up in Puerto Rico, working in his family’s French Bakery (his parents are Lebanese) and attended the French Culinary Institute in New York (graduating in 1996) and has been an executive chef for over 1o years. 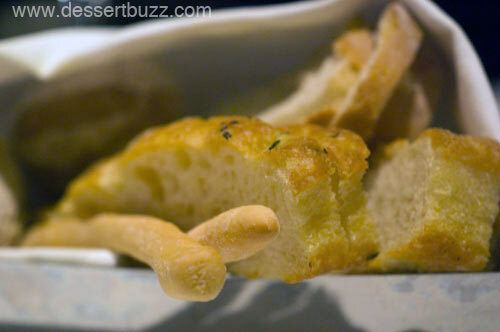 As we race-walked back to the dining room through yet another kitchen, he quickly pointed to some cooling shelves “Our house-made foccacia and other breads are baked twice per day” and then introduced me to executive chef Fabrizio Carro before letting me rest at a table on the first floor dining room and mentally prepare for the tasting. 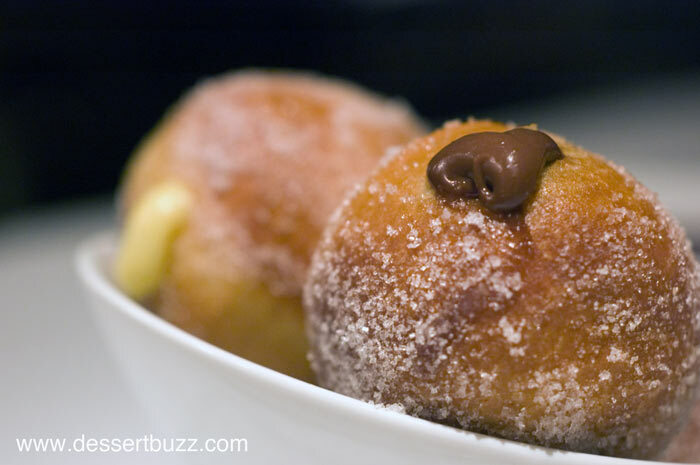 The bombolini are the most popular dessert at Quattro (“Italians love their bombolini” Bachour says). They arrived piping hot with a side dish of dark chocolate ganache made with 64% Manjari. Our three perfectly round donuts were filled with vanilla pastry creme, chocolate pastry creme, and apricot jelly. The apricot filled was easily my favorite. Maybe I was affected by the story–the apricots came all the way from the Piedmont region in Italy and are prized for their flavor–and damn, they were flavorful. I’ve had many tricked out donuts filled with salted carmel (delicious BTW), fluff, etc., but the apricot is a refreshing and unique take on a classic. 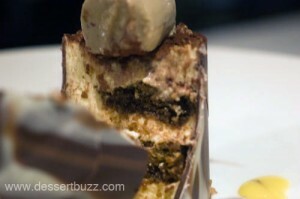 Though I write a dessert blog, I must admit, tiramisu is not one of my favorite desserts. Often I find the mascarpone and sugar mix too sweet and too heavy. This tiramisu however, was a different story. The mascarpone layer was much lighter than usual–it’s whipped up almost like a mousse. The lady fingers inside are soaked in an espresso Kahlua (with real alcohol) which really cuts the sweetness and adds flavor. 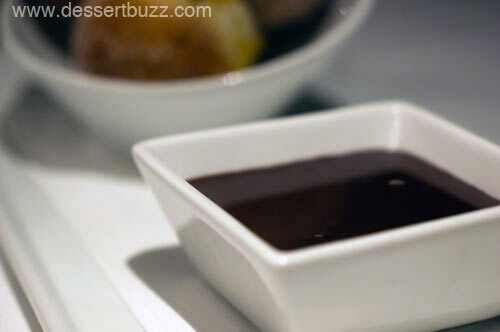 The chocolate that serves as a container for the dessert is about as thin as it can be while still being able to hold the dessert upright. This black-belt-level feature allows you to cut into the dessert without exploding it all over the plate–which would happen if a thick, brittle chocolate was used as the container. Of special note is the top notch espresso gelato, one of the best gelato coffee flavors I’ve tasted. I was told that the Piedmont hazelnut cake is a special regional dessert that Italians go crazy for. It’s unusual in that the cake itself is little bit on the dry side and not at all sweet. I enjoyed the lack of sweetness because in the center of the cake was a vein of house-made “Nutella” hazelnut and dark chocolate paste made from (what else?) 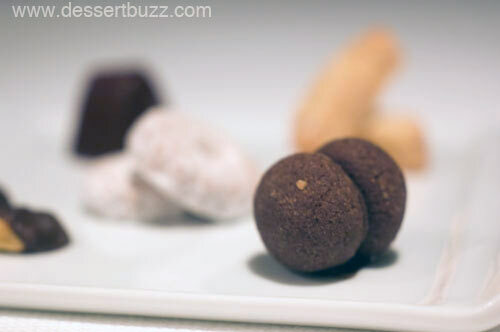 Piedmont hazelnuts which are purported to be the best in the world. 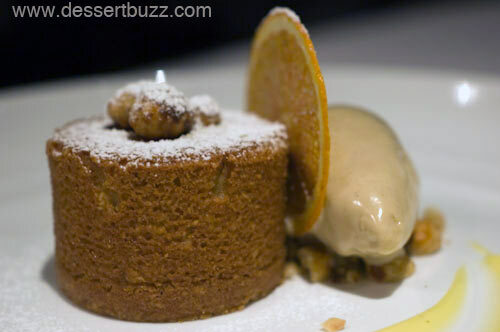 The cake is also served with (hope you can guess by now) superb hazelnut gelato. 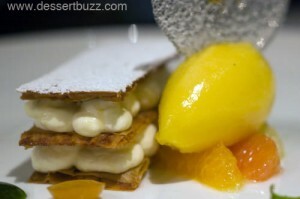 The lemon Napoleon marked the start of the more involved, technically difficult desserts. Like the others before it, this dessert could have been very heavy but wasn’t. As a matter of fact, all the components of this dessert were very light, except the creme filling in between the wafer cookies of which there was very little. My favorite part of this dessert (besides the beautiful presentation of colors across the plate) was the candied kumquats and other citrus pieces, like the bitter orange, that surrounded the Napolean. The tart flavors perfectly balanced out the sweet creme filling. Mandarin orange sorbet continued the streak of great flavors. 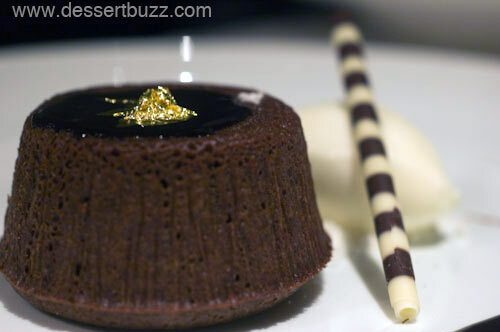 When the warm molten chocolate cake came out Chef Bachour seemed almost apologetic. “I don’t like this dessert!” he said. I asked why, and he said “because everybody has a molten chocolate cake! It’s been around for a long time! But sometimes you have to do what the bosses want!” He later admitted that it’s a crowd pleaser and receives many orders. Despite his reluctance about the dish he did add some special features. The cake comes with an organic milk gelato–made with just two ingredients, milk and sugar. The gelato is superb, especially next to all the dark chocolate. It’s also served with a gold leaf on top. It’s not a new dessert but you can’t really go wrong with with 64% Valrhona Manajari and plain milk gelato. 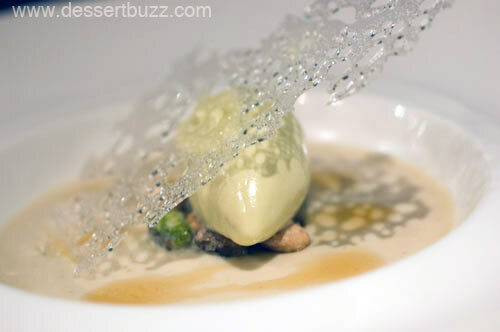 The two offerings of the evening that showcased Mr. Bachour’s talents best were certainly the Italian nougat panna cotta served with pistachio gelato and honey syrup and the chocolate hazelnut semifreddo, torrone gelato and caramelized bananas. The nougat panna cotta is an example of how you can make an outstanding dessert with a subtle flavor like nougat. This silky smooth panna cotta was the best I have had in New York. First, very little gelatin was used in this dish. It’s served in a bowl like a soup but not molded into a special shape or cone–this reduces the need for gelatin which contributes nothing to the flavor. Second, it wasn’t too sweet. There was just enough honey syrup drizzled throughout the dish to make it work. Add some great house-made pistachio gelato and you have a winner. My dining companion and I both agreed this dessert was something special–a 10 out of 10. I thought I understood what a semifreddo was supposed to be all about. 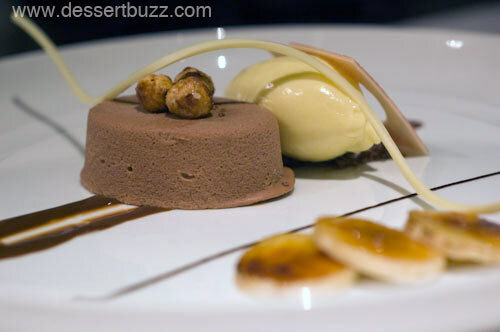 But, after trying Quattro’s chocolate hazelnut semifreddo, I’m not sure that I ever had a properly executed one. This semifreddo is almost like a frozen mousse but with no ice crystals and tons of hazelnut and chocolate flavor. 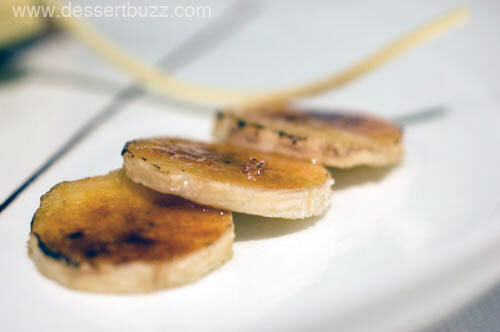 It’s served with a torrone (nougat) gelato and perfectly carmelized bananas (see the photos). Again, the gelato was smooth and had a very pronounced flavor, and went perfectly with this dish. The final dessert of the evening (before the petit fours) was not yet on the menu. 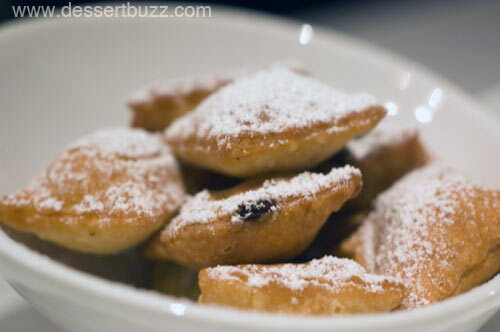 It consisted of house-made raviolis with hazelnut-chocolate filling and then is dusted with powdered sugar. All of the components are perfectly executed–the pasta is made fresh from scratch every morning–and tastes like it. The hazelnut and dark chocolate paste are delicious. There was just a bit too much pasta in every bite in relation to how much chocolate there was. I suspect the ratios will be tweaked before this dish gets the green light. 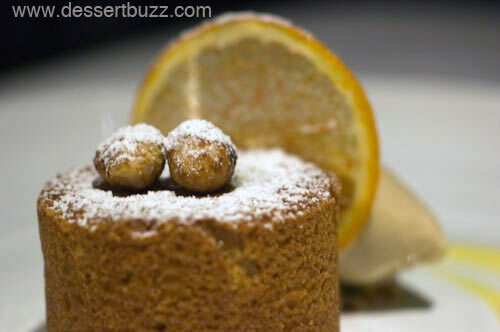 Disclosure: It’s not often that I get the opportunity to try seven plated desserts, in one evening, from one of New York’s top restaurants–but two Mondays ago that’s just what happened. 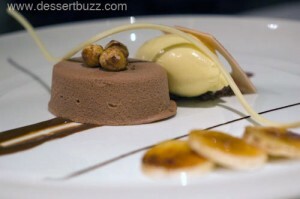 Quattro invited DessertBuzz (DB) as their guest for a tasting of 7 desserts from their menu. These desserts were provided to DB free of charge. DB is under no obligation to post a positive review or post any review at all. DB received no monetary or any other compensation. Opinions expressed herein are mine alone except where I credit other people with them. @Jen this place blew mind, I struggled to find anything that could be improved. They would make a fine business just selling their gelatos – Hey wait “Quattro Gelato” – I should trademark that. The City Sweet Tooth » Sweet Links of the Week 3/4! Thanks Niko the photos are fantastic!!!!!!!!!!!!!!!! Antonio is great! His desserts are very thoughtful to detail and exciting to eat.he has my vote as one of the best pastry chefs in the nation! What a post. Those desserts look se delicious. Thanks for sharing! I;ve eaten there twice and both the food and the desserts are exquisite. The lemon napoleon is ambrosial, the hazelnut semifreddo was toothsome and the bombolonis yummy. 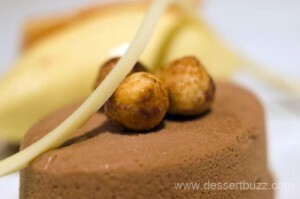 I went last weekend and desserts was great, my favorite is the gianduja semifreddo!!! at Yahoo’s home page and see how they create article headlines to grab people interested. it from a lot of varied angles. Its like women and men don’t seem to be fascinated except it’s one thing to accomplish with Lady gaga!